Welcome everyone!!! 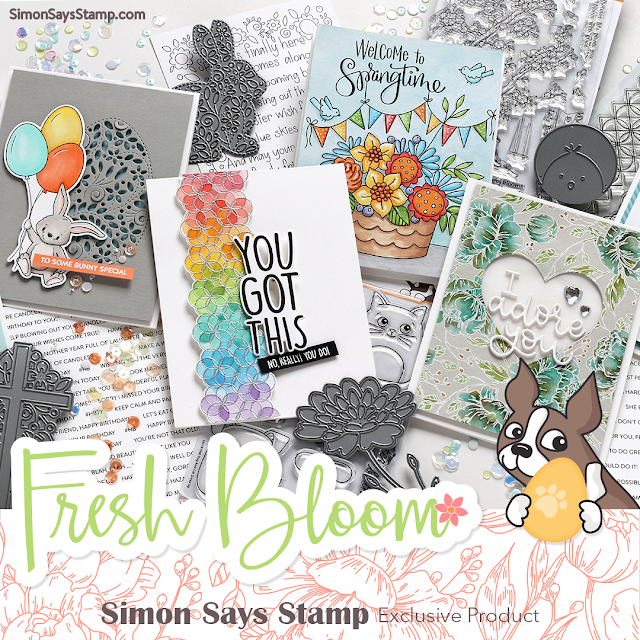 We've just released the Blossom and Butterflies collection of stamps, dies, stencils, and more from Simon Says Stamp!! I've created a couple cards to spark some inspiration. 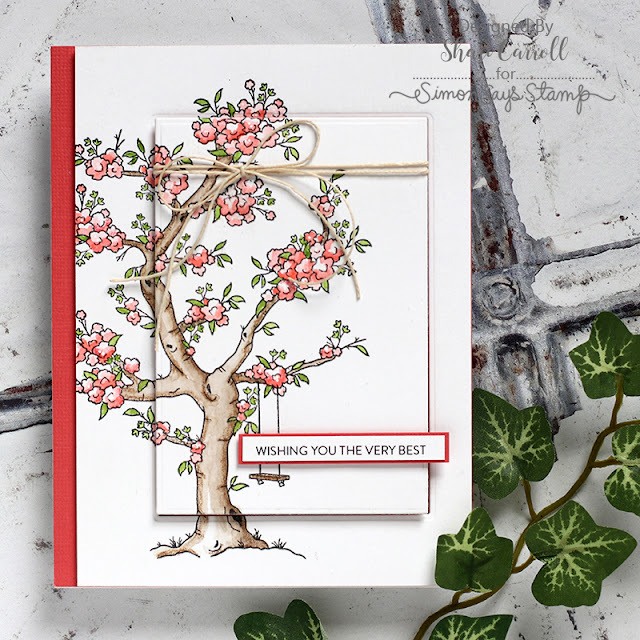 This first card uses the stamp set Wake Up and Make Up designed by Kristina Werner. This set is so fun!! !I stamped and colored the images, cut them out and mounted them to a strip of color blocked paper. Quick and Easy!!! Do you like to color on the go??? I love this new set of Watercolor cards from Suzy Platamura. There are 12 cards in the pack, many of them large flowers. 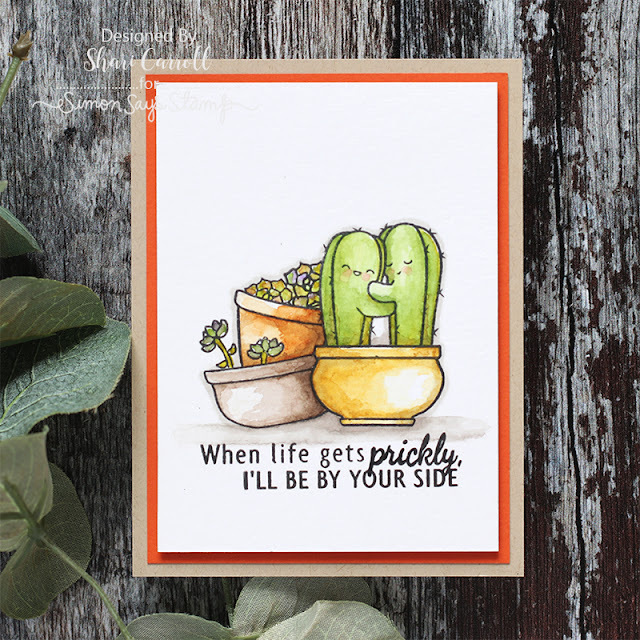 This cactus card tickled my soul... I watercolored first, then went around the images with a light grey Topic marker. You can check out the entire release HERE, or check out the individual links below. Thanks for stopping by!! 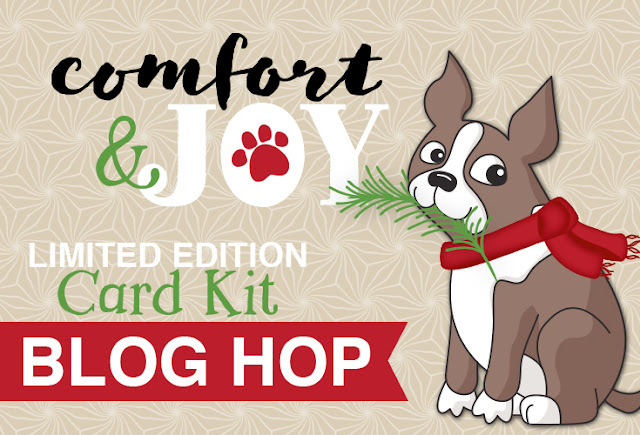 Welcome everyone to the Simon Says Stamp celebrating the Limited Edition Comfort and Joy Card kit!! If you're coming from Nichol Spohr's Blog, then you're in the right place. 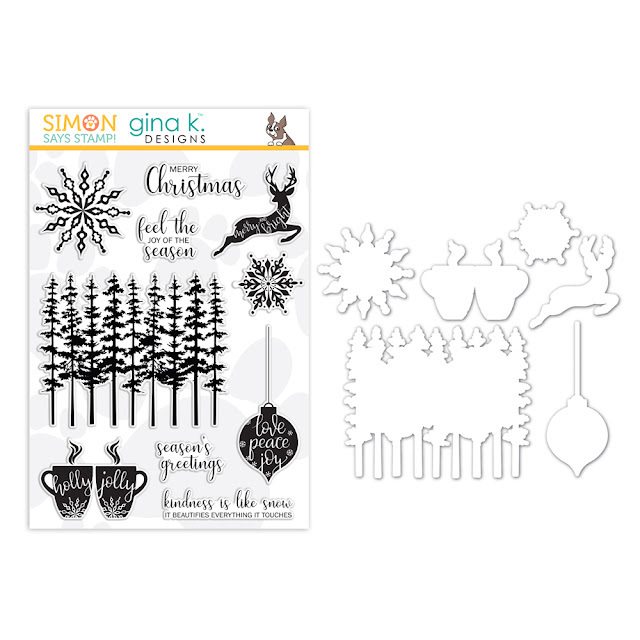 This kit is pack full of amazing goodies to make cards and tags for Christmas. You can check out the details HERE. 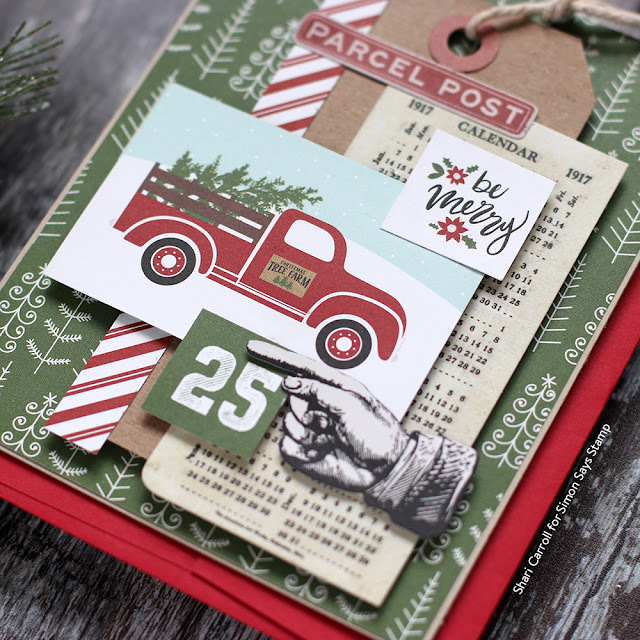 For the hop today, I've created two cards featuring stamps and ephemera. First up is a card that is just layered elements from the kit. I've cut up some of the papers to add to the mix to create my arrangement all set upon a Kraft tag. 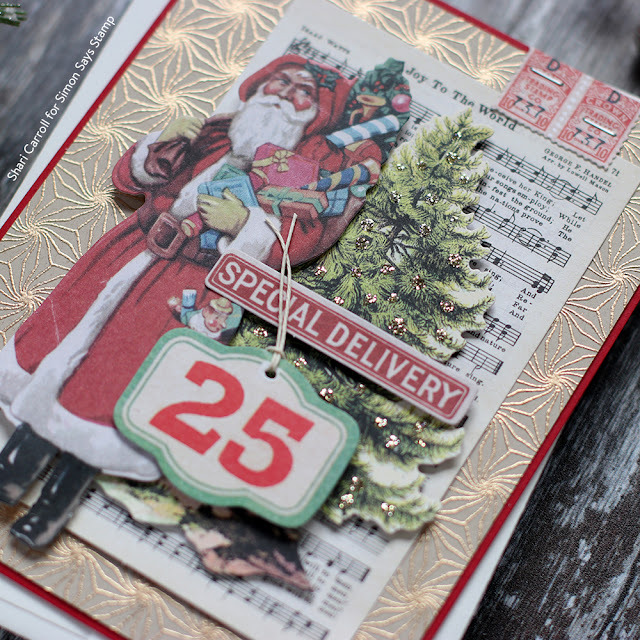 For this next card, I gold embossed the Poinsettia background on a panel of Desert Storm cardstock and added layers of the Tim Holtz ephemera to create my layout. To finish it off, I added Gold Stickles to the tree. 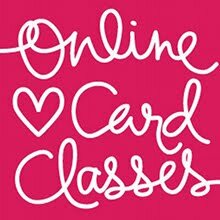 I just LOVE layering and creating arrangements on my cards!!! Below is a list of all the blogs to visit today. Hello everyone! Happy November!!!!! I can't believe how quickly this year is going by! Can you? I've been asked a lot about this card as to how I made it. I'm so sorry I didn't shoot a video, I was in a card making frenzy and forgot. Sooooooo I'll give you some brief step by step instructions. 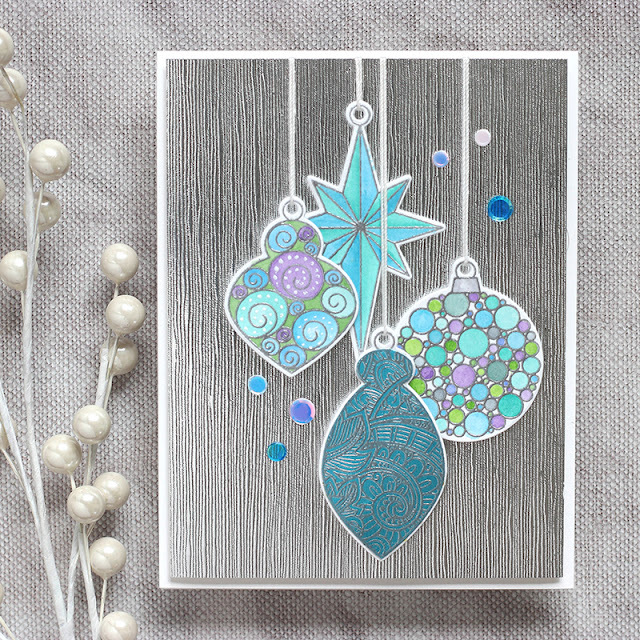 I started off stamping the ornaments onto Tim Holtz Distress watercolor cardstock with Simon Says Stamp Clear ink and used Simon Says Stamp Silver embossing powder, then heat embossed. The ornament at the bottom is stamped onto Tonic Imperial Blue cardstock. Then I used my Mijello Mission watercolors to paint in the areas, using blues, greens and purples. I die cut the ornaments out with the coordinating dies. and strung white crochet thread through the holes of the ornaments. Next I cut a panel of Silver Tonic cardstock to 4x5.25 and mounted the ornaments to it with foam tape. I wrapped the string to the back or the cardstock and secured them down with tape. The Silver panel got mounted onto a Simon Says Stamp Top Folding notecard with some foam tape to lift it up a bit. To finish the card off, I added some confetti using Simon Says Tacky Craft Glue. 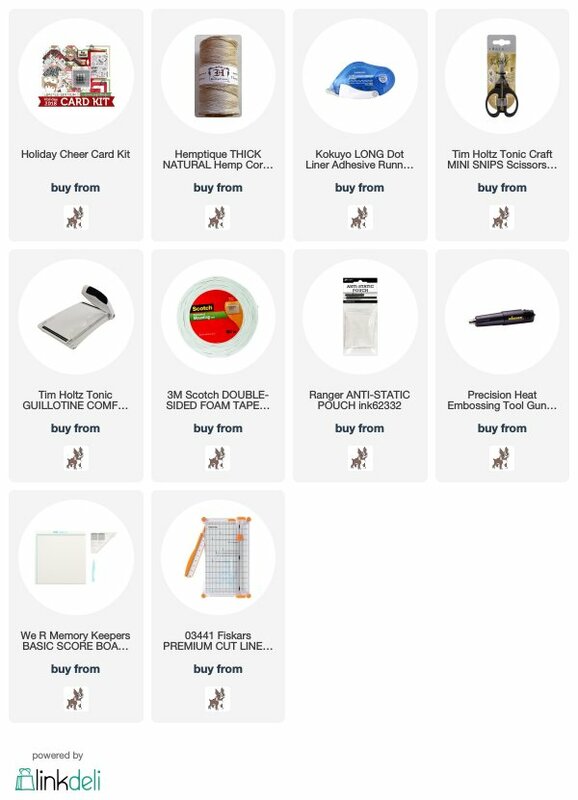 I've listed all the supplies below for your reference, I hope you enjoy and have a great day!!! Halloween Limited Edition Card Kit!! 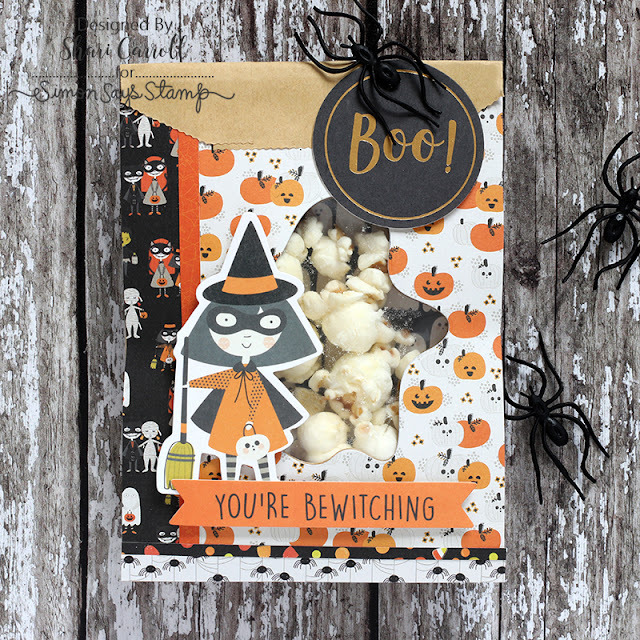 Limited Edition Halloween Card Kit: Frightful Fun!! 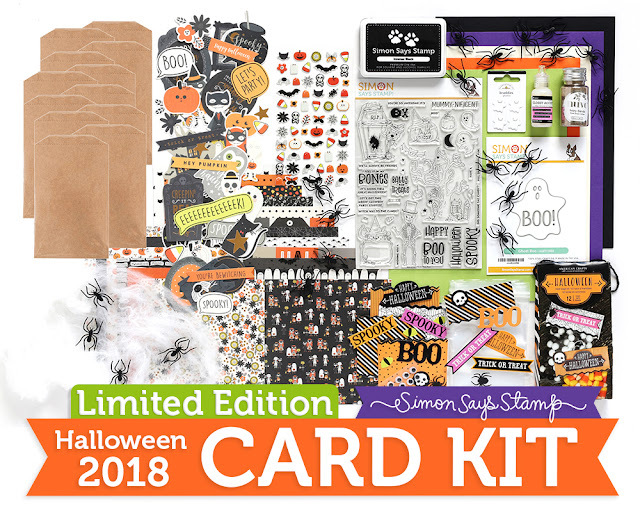 This is a super fun card kit with everything needed to created cards, goodie bags and decorations for Halloween. 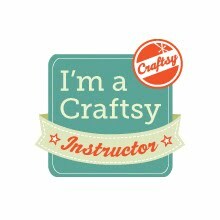 I've created 3 quick and easy projects using this kit. To start off, I've die cut 3 Ghost Boo's using Halloween color cardstocks, and placed them onto a black panel. 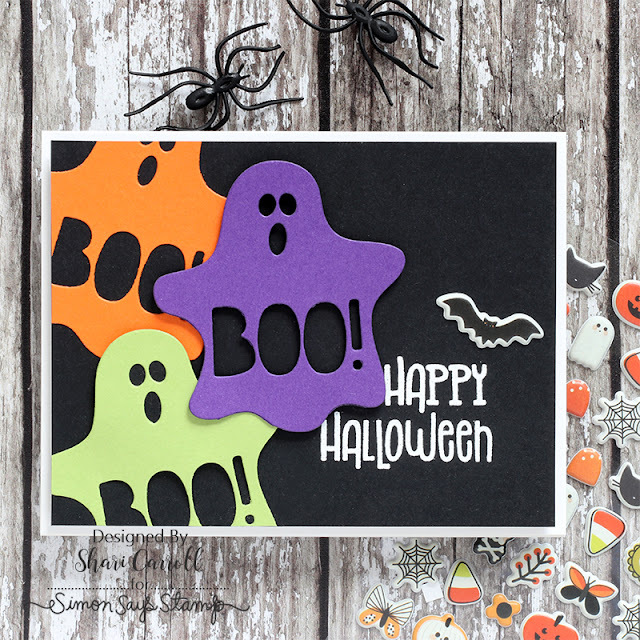 I white embossed the Happy Halloween greeting, added a Pebbles puffy sticker and this card is complete! 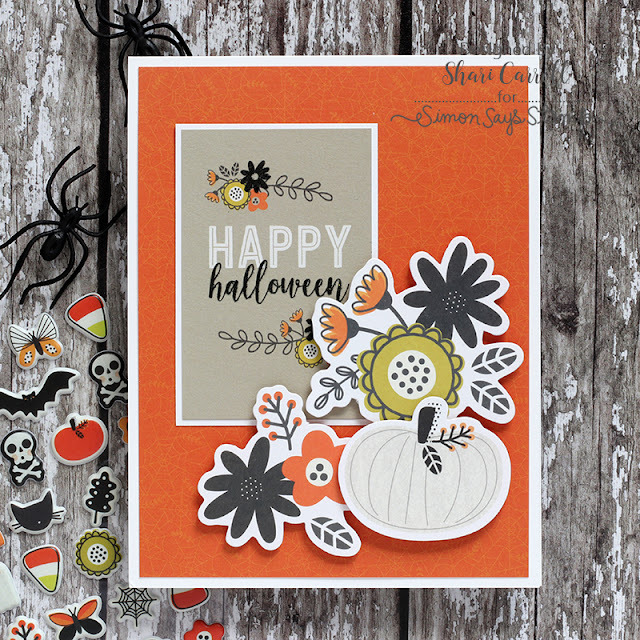 Next, I used the Pebbles Inc. Spooky Boo die cut pieces to create an arrangement, then cut our one of the panels from the Spooky Boo 6x6 printed papers. This is a nice mature card for adults. Finally, I created a goodie bag where I've die cut the Ghost Boo through the kraft bag and papers. I decorated the front with additional strips of papers and die cut shapes. I filled one of the American Crafts treat bags with some flavored popcorn and slid it it in and folded over the top securing it with an additional die cut shape and spider clip. 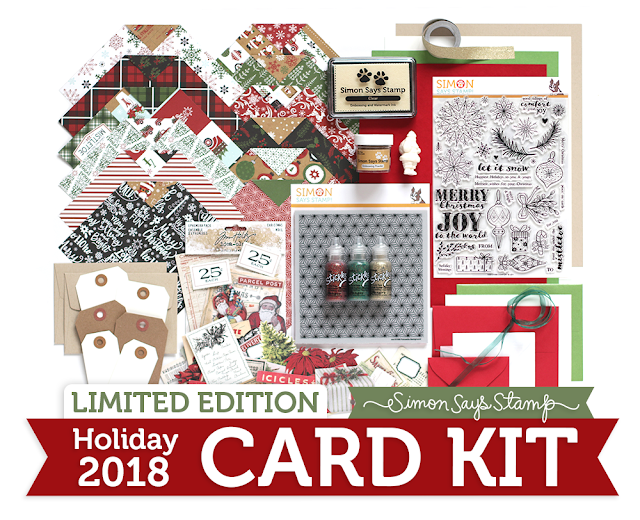 This is a limited edition card kit, so you may want to act fast!! 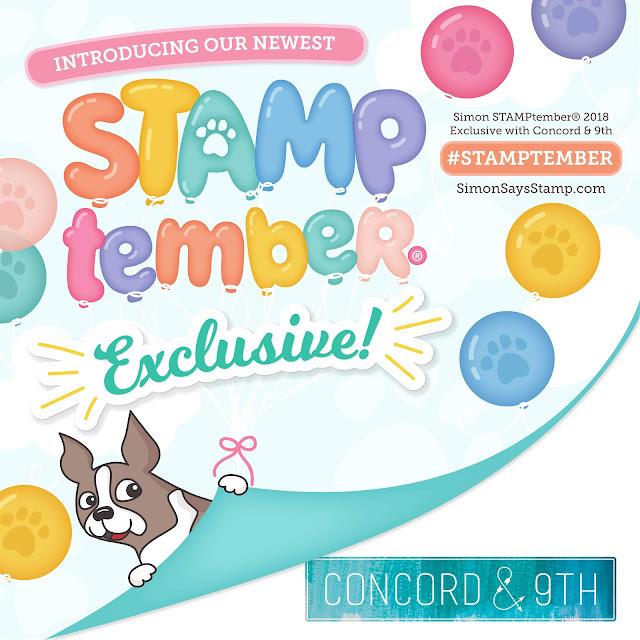 STAMPtember® Exclusive Concord & 9th!! Monster Hugs Stamp set from Concord & 9th. Once my paints were dry in the balloons, I stamped a light tone hearts using Surf Blue and Fog ink. The Monster Hugs stamp set is really fun, it has messages that can be used for all kinds of occasions. Thanks for stopping by, I hope I've added some inspiration to your day! Enjoy!! 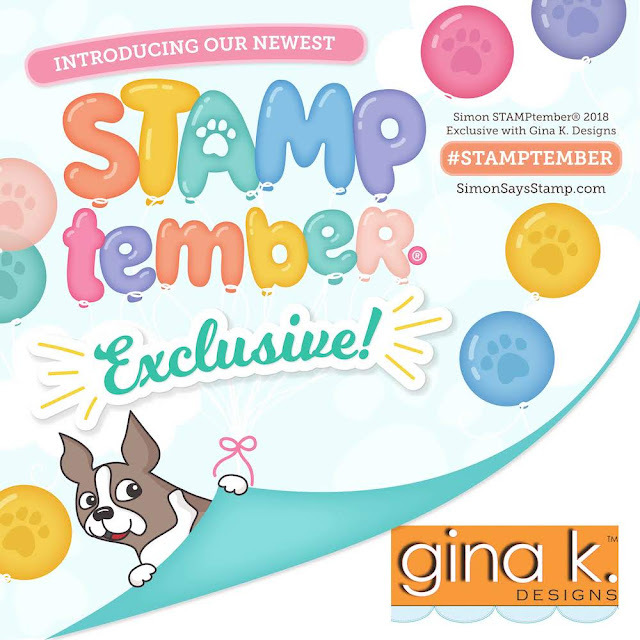 STAMPtember® Exclusive Gina K Designs!! Welcome back everyone!!! 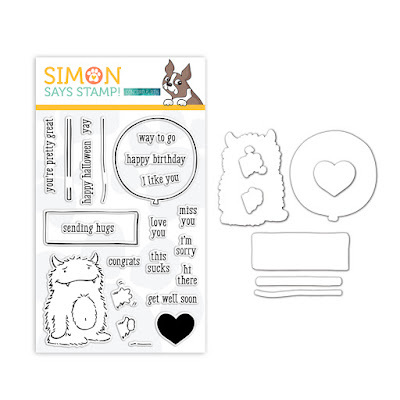 I'm back with another Simon Says Stamp exclusive STAMPtember® stamp set. 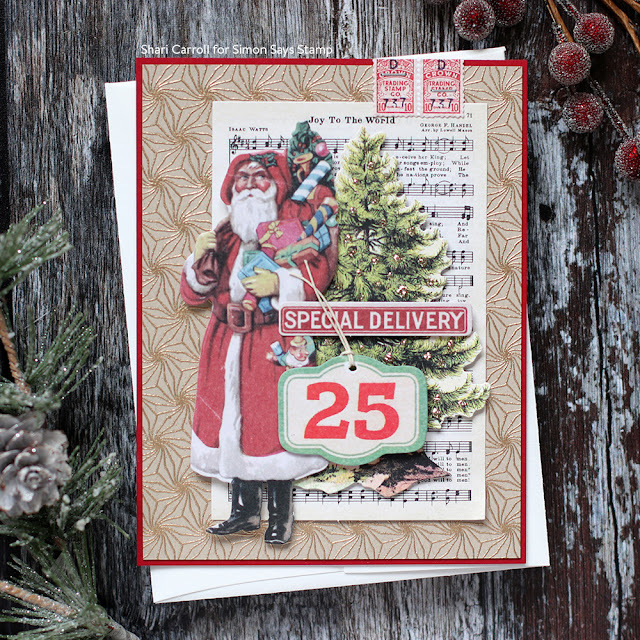 Let me introduce you to the Gina K Designs Joy of the Season !!! 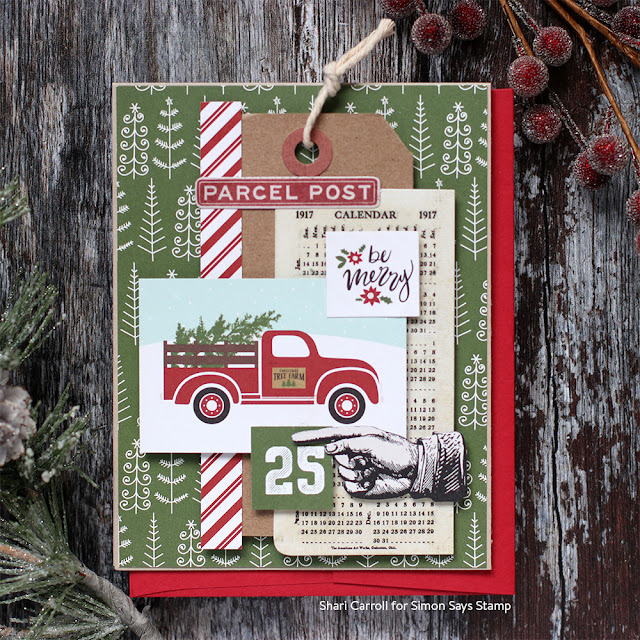 It's gorgeous and perfect to jump start your holiday cards. I've created a simple card that I can create multiples of. Simplicity is sometimes best, especially for the holidays. I've white embossed the trees onto some printed paper then blended in some light tones of Distress inks to make them pop against the light paper. 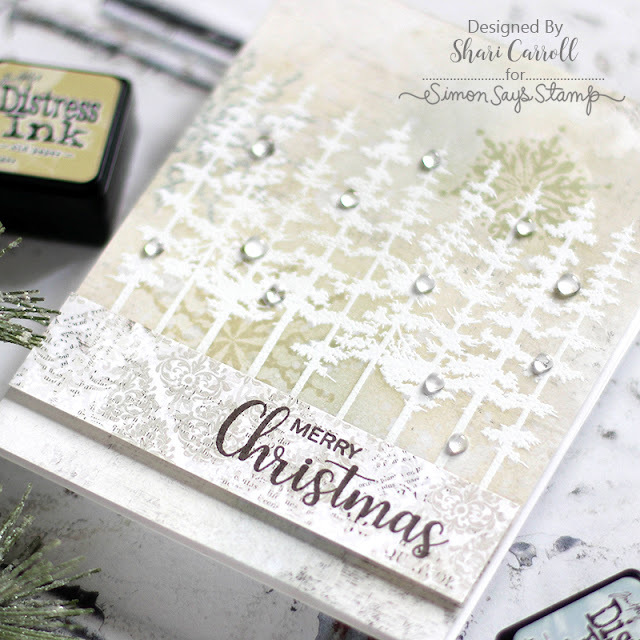 I stamps a few snowflakes (which the trees resist) in the same Distress ink colors. I have filmed a video of the process that you can view below or on my YouTube channel HERE. I hope you enjoy this beautiful stamp set from Gina K. Thanks for stopping by, I'll see you again soon!! 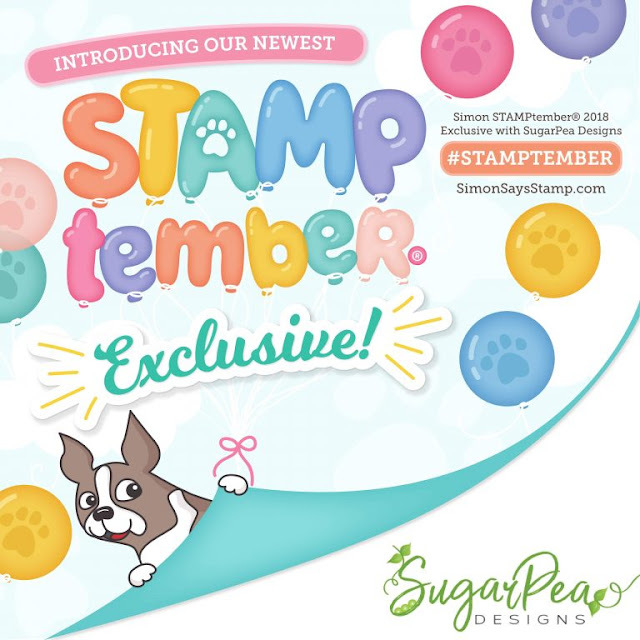 STAMPtember® Exclusive Sugar Pea Designs! Welcome everyone!! I'm loving STAMPtember... seriously, so many fun things to play with. 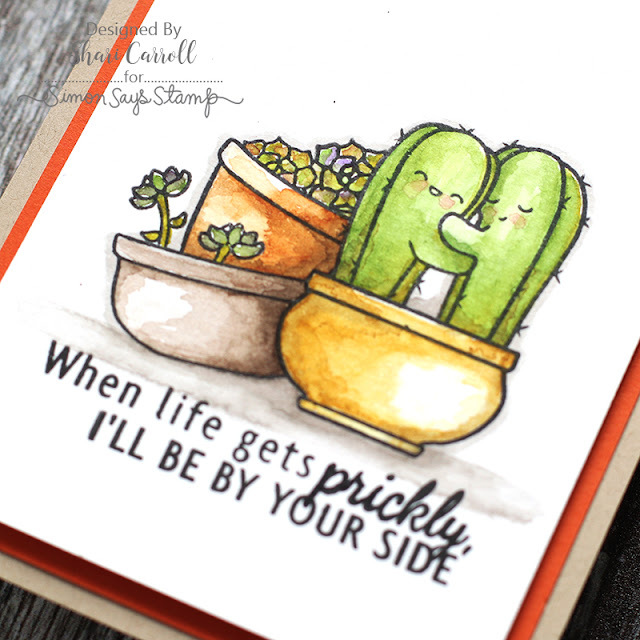 Today's featured stamp set is the Cuddly Cacti from Sugar Pea Designs. I did a bit of masking to create a grouping. These are one of the easiest sets to mask with their straight edges. Just remember to start with the images you want to be in front first and work towards the back. I've pulled out my Mission Mijello watercolors to paint these sweet beauties. I kept it simple with basic painting and added concentrated color for shadows. I also used some warm grey Copics to outline the images for a little bit of dimension. Thanks for stopping by. I'll be back tomorrow with another exciting stamp and die set. ENJOY!! Simon Says Stamp STAMPtember® Party!! Welcome everyone!!! It's an exciting time of year... 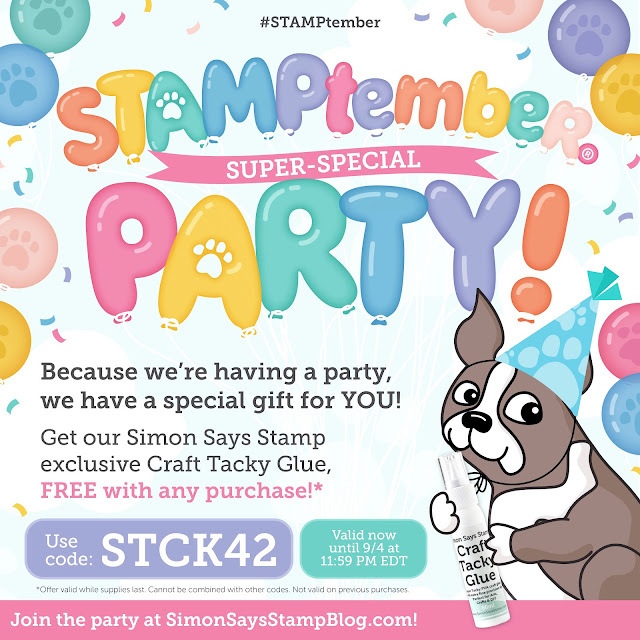 It's STAMPtember® and we're having a blog party full of inspiration, promotions and codes for special prizes. 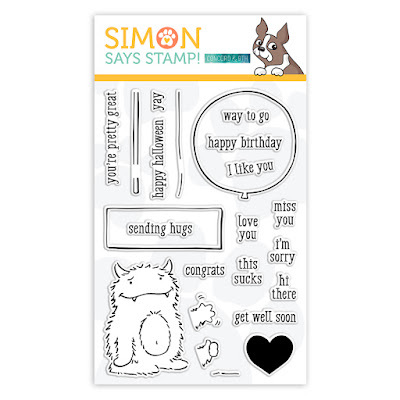 First is the Exclusive Simon Says Stamp release. There is something for everyone. 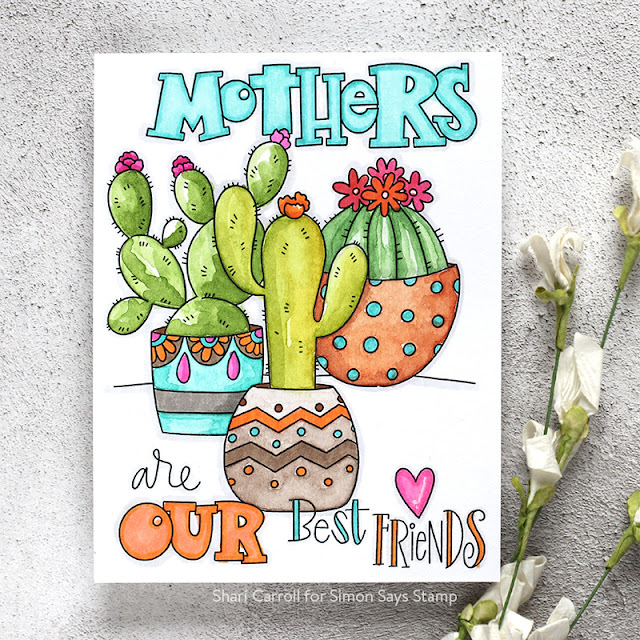 We have stamps and dies for everyday cardmaking including Birthday, beautiful quotes, as well as some exciting holiday images. Don't miss the large Picture Book dies, they are adorable!! 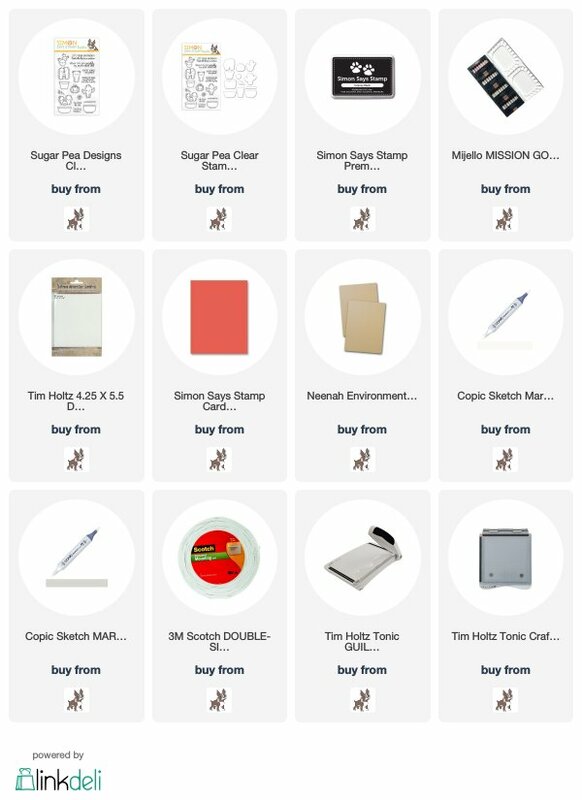 You can find the entire list of STAMPtember® Products HERE! 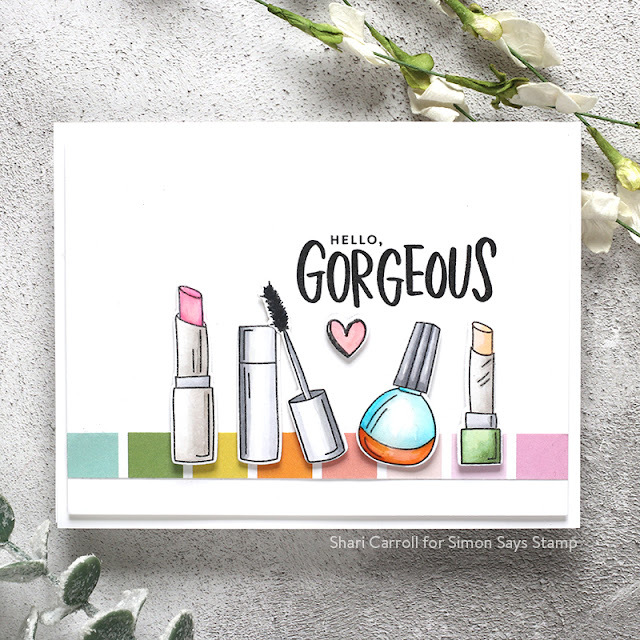 I've created several cards using a variety of NEW Simon products. I'll start you off with a Birthday Border set that I designed which has candles and fun messages can stack. 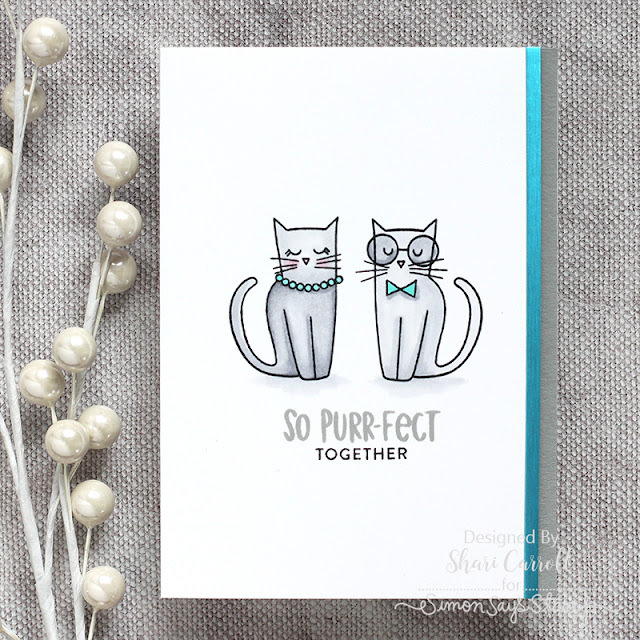 Another card I've created uses a Kristina Werner design Right Meow stamps and die set. These stamps have whimsical cats in all sorts of positions with punny messages. I created a set of Festive Trees in stacked shapes. 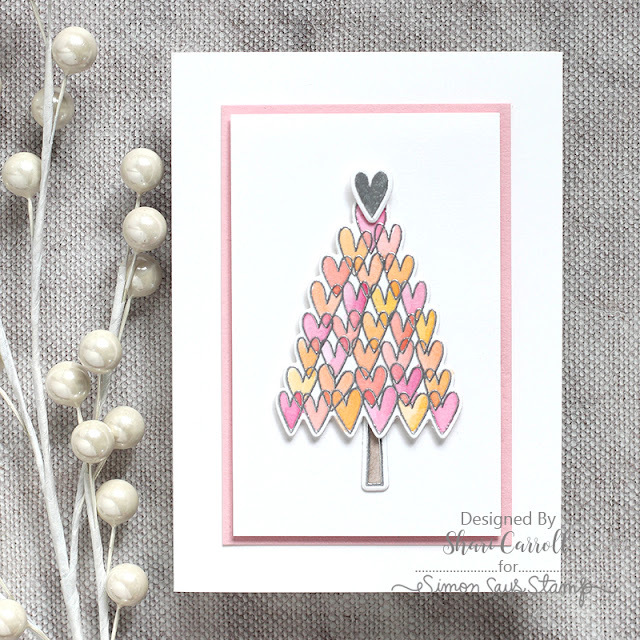 This card features the heart tree watercolored with pinks, and yellows. Who doesn't love a Gingerbread man... this is from the Hip Ginger set designed by Stephanie Low which includes clothes, facial hair, glasses and hats that can be mixed and matched. 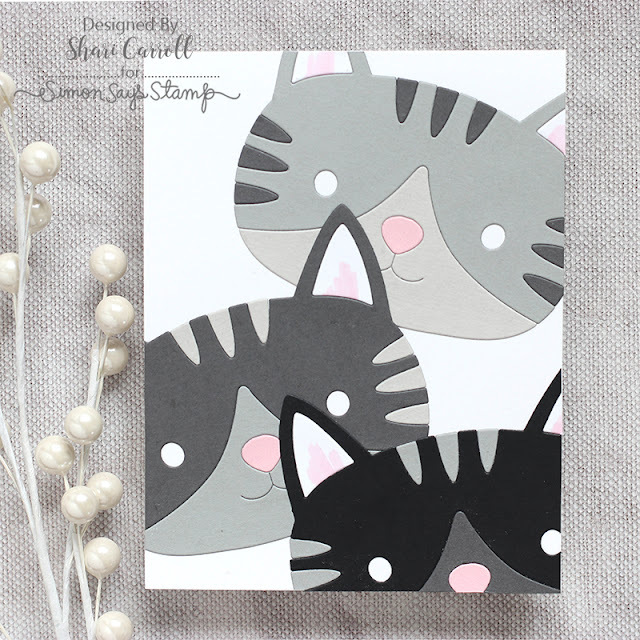 And finally, a card featuring the adorable Large Picture Book Kitty in shades of grey and black. As part of this blog party, each participant has special codes for free items to feature on our blogs. 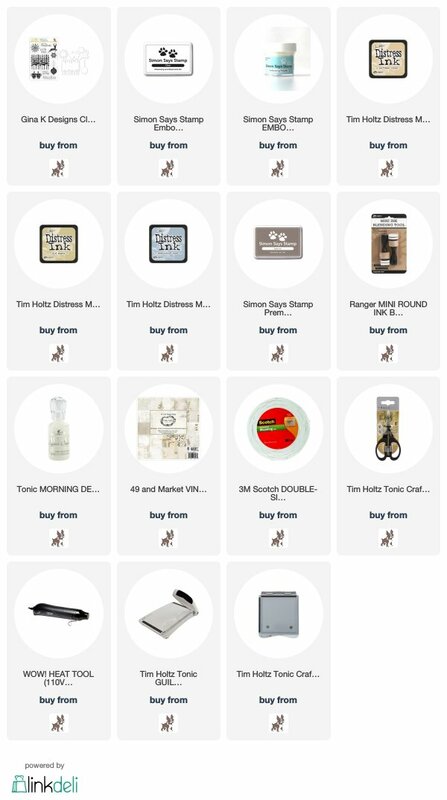 I encourage you to check out everyones blogs to find codes for gifts while shopping. 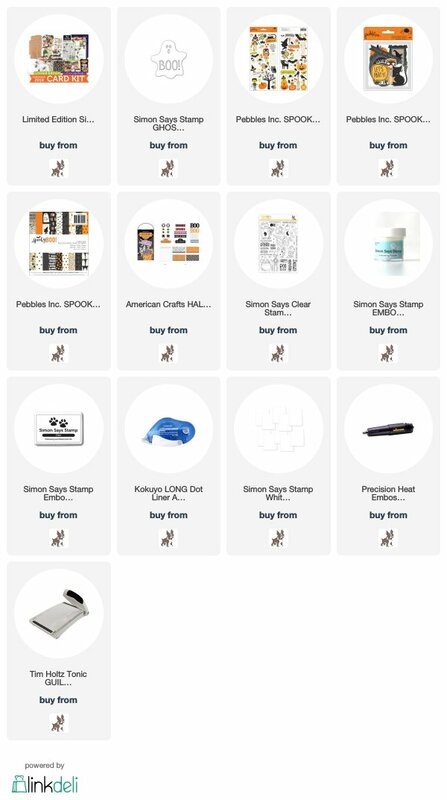 I'm excited to share with you my favorite glue... Simon Says Stamp Tacky Glue!! 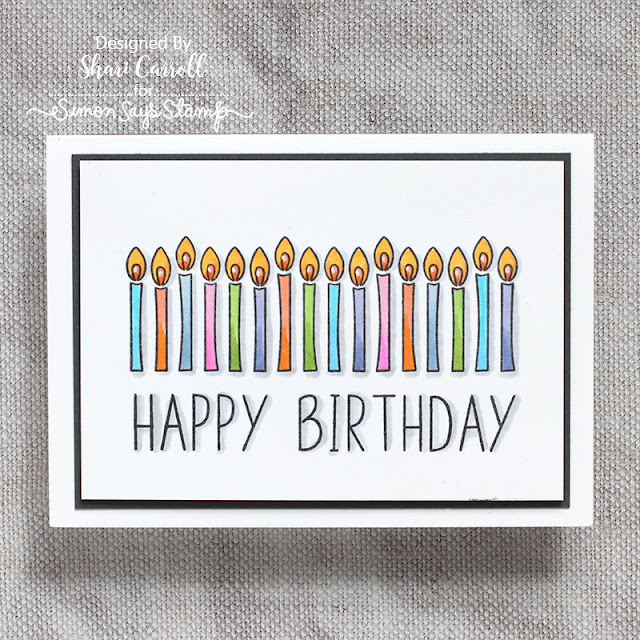 Be sure to check out the Simon Says Stamp Party Blog post HERE for a complete list of all the participants in this celebration. Thanks for stopping by and Happy Crafting!!! Simon Says Stamp #SSSGoodVibes Release is HERE!!! This is such a fun release, perfect to start summer off with a bang!!! It's like taking a walk in the sand with waves crashing at your feet, surfboards, sunshine, memories of being raised in Laguna Beach!! Good Vibes for SURE!! I have a couple close ups of some cards that I created. The full shots will be featured on the Simon Says Stamp blog for two of the hops Thursday and Friday this week. 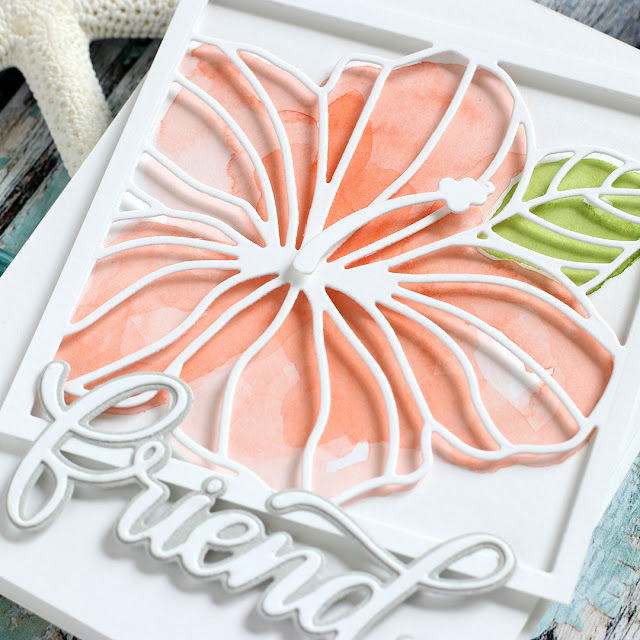 This first card features the Hibiscus Frame Die. It's simply die cut from white paper with a bit of watercoloring underneath. 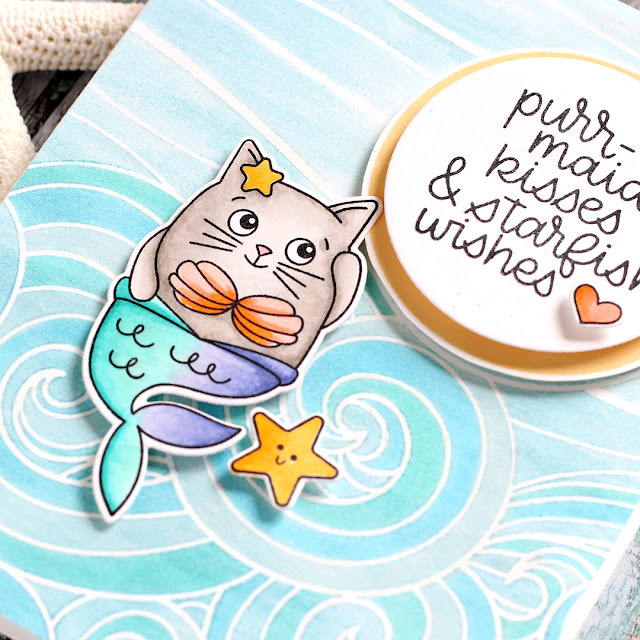 Next up is a cute one featuring Kristina's Summer Cuddly Critters with the gorgeous Beachy Waves background. And finally.... Surf's Up!!! 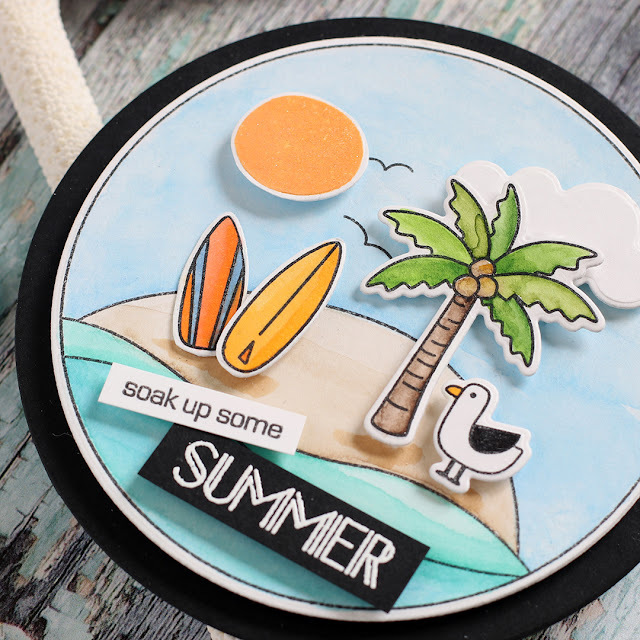 A set I designed where you can create a fun beach scene with a palm tree, seagull, surfboards, towel, pail and starfish. What??? How fun!!! You can find the entire Good Vibes release HERE or a look at the items below. I hope you think this is as amazing as I do!!! Thanks for stopping by!!! 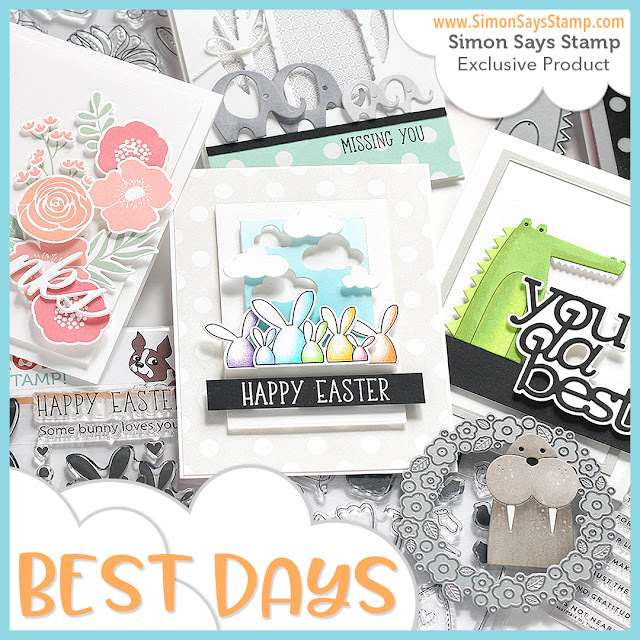 Best Days release from Simon Says Stamp! I'm super excited to share with you our newest release BEST DAYS!! 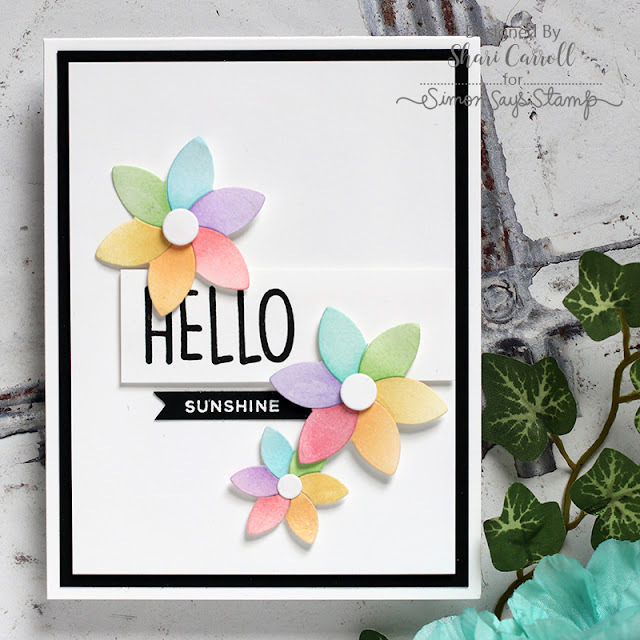 This is full of fun Spring stamps and dies, plus some unique coloring pages with Daniel Smith paints. There is something for everyone! I've created the samples in the photo above but thought I would highlight a few for you. 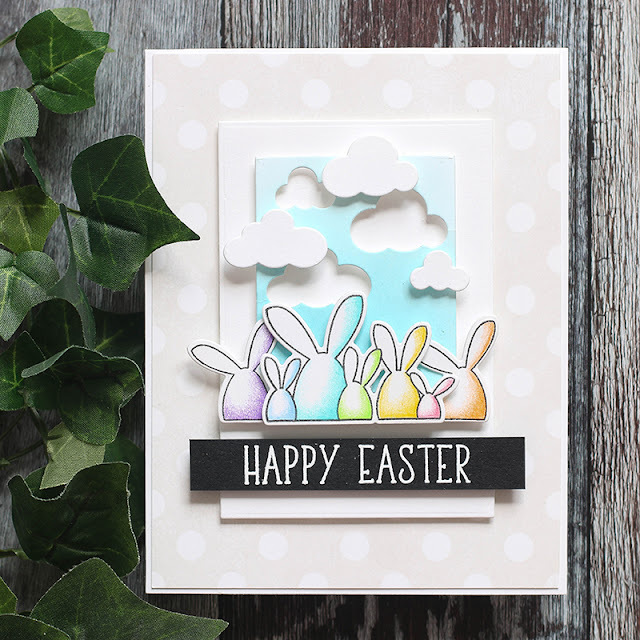 This first card uses the Oh Bunny stamps and coordinating dies with the Picture Book Sky Background die and the Reverse Polka cling stamp. I used color pencils to shade the bunnies. 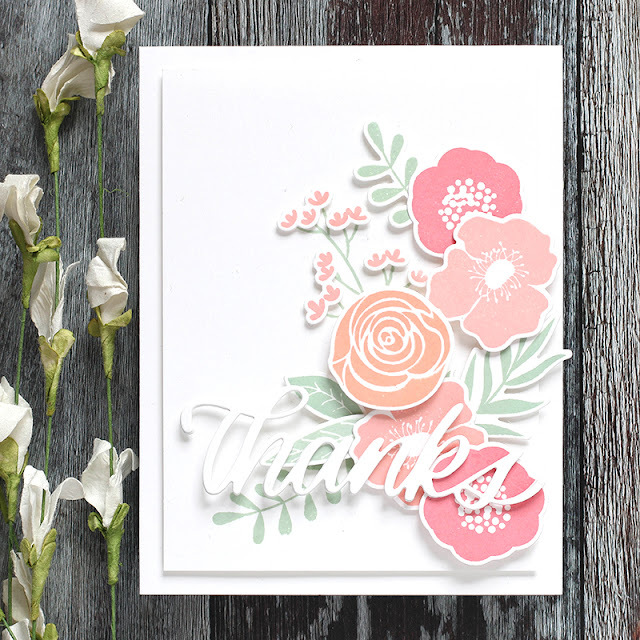 This next card uses the Bold Flowers Stamps and coordinating dies plus the Big Thanks Die. 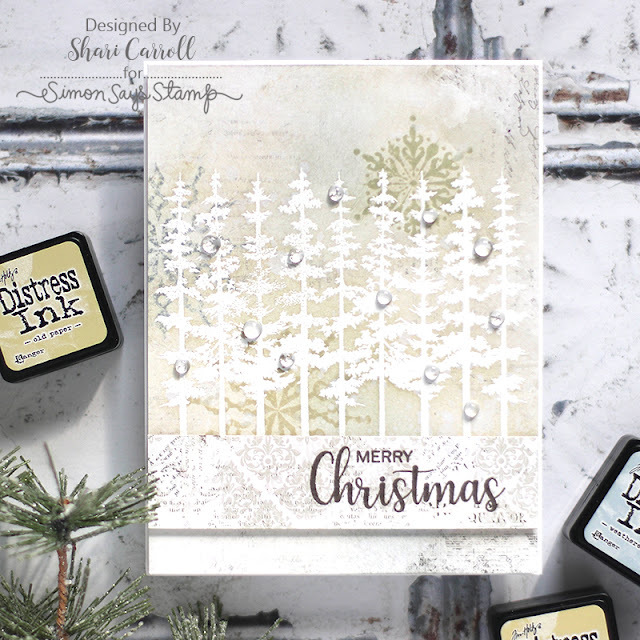 The inks I used are Dusty Sage, Teeny Bikini, Rosie Cheeks and Twirling Tutu all from Simon Says Stamp. Simon Says Stamp BEST DAYS below.